Albion College’s President Donna Randall announced March 28 that she would be stepping down form her position. 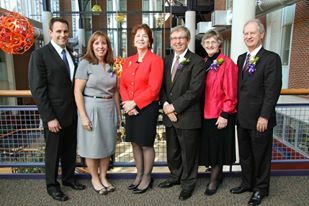 Randall, who became the college’s first female president in 2007, will end her term on June 30, 2013. No Albion College president has served for under 10 years since the 1920s. Randall denied that the Board of Trustees put pressure on her to step down, as some students believe. Casey Hoffman, ’12 alumnus and recent graduate trustee, notes that Randall worked during difficult times at the college. Some Albion College faculty have also suggested that Randall was pressured to resign by the Board of Trustees. The Board of Trustees will begin a nation-wide search for the school’s next president and will hopefully selected a candidate by the end of 2013. The committee, composed of faculty, staff, alumni, student body, community and trustees, will be lead by Mark Newell, ’77 alumnus. Randall provided some words of advice for the future president. “Enjoy thoroughly every day on the job and be thankful for the opportunity to serve such an outstanding institution,” Randall said. Thomas Courtice of AGB Search will also contribute to the search for Randall’s replacement. The Pleiad contacted Courtice, but we received a statement on his behalf from Sarah Briggs, associate vice president for communications at Albion College. The Board of Trustees has named Randall chancellor until June 30, 2014. Only Randall and Dr. Bernard Lomas, who served as president from 1970-83, have had the title of chancellor. Not only will Randall continue to fundraise for renovations to the Dow Athletic Center and Stockwell Library, but she will also advocate for Albion College. When asked about what has been the most difficult part of her presidency, Randall discussed the financial trouble facing students and families. Randall noted that her legacy will be determined by others, but she hopes that her work will be remembered in a positive way. “I would hope that I am viewed as a principled leader with a clear vision and deep commitment to Albion College, and a leader who helped the college navigate through a challenging time,” Randall said.